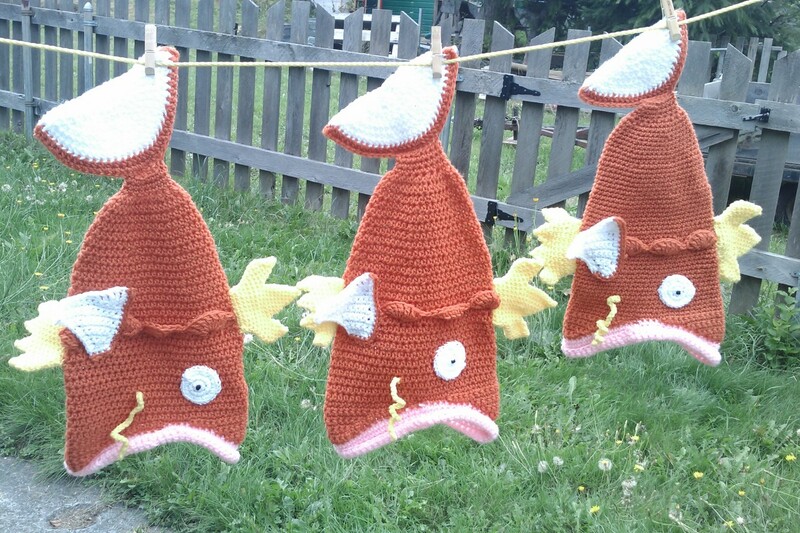 Sept 8, 2013: The Tyee Fish Hat pattern is back online, but it is no longer free. 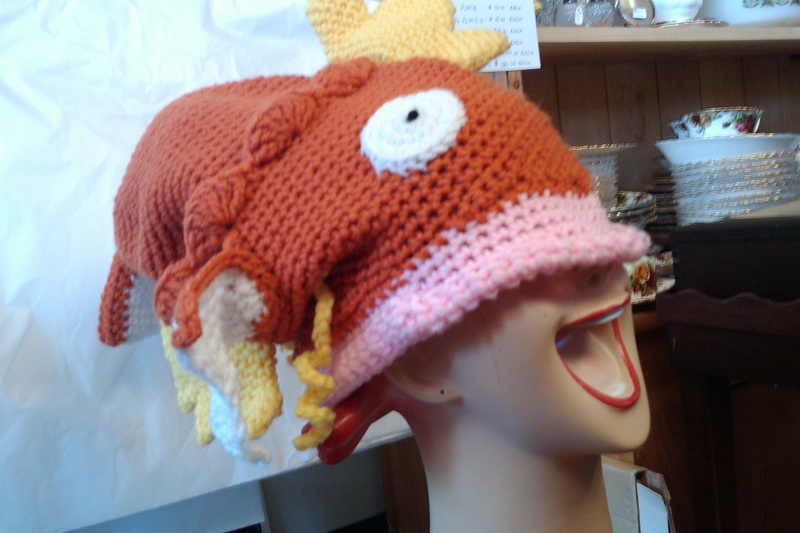 However, I am charging a smaller amount for the Tyee Fish Hat pattern than for other hat patterns. 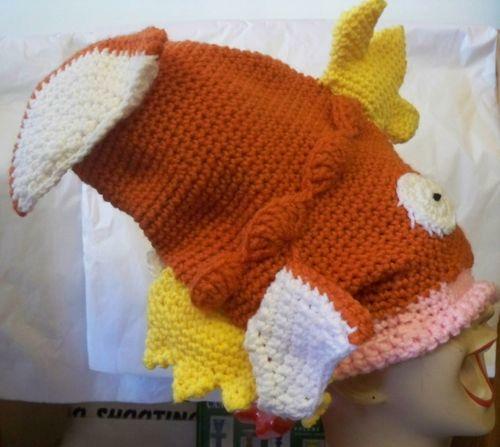 And the Tyee Hat is now joined by another Fishy friend, the Magic Carp! The new pattern is ready, after numerous requests to write out the instructions to make this variation. 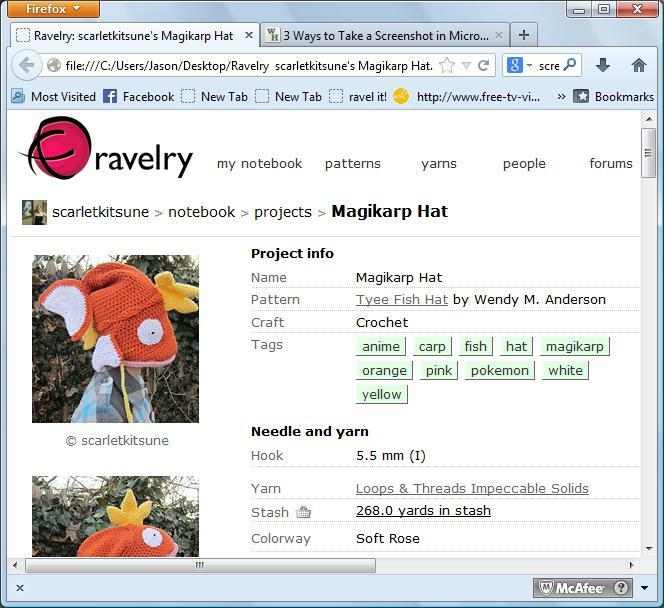 MAGIC CARP, inspired by Magikarp: Now you can make your own and be the talk of the Geeky community! Here is the Geekishly Delightful Pattern. 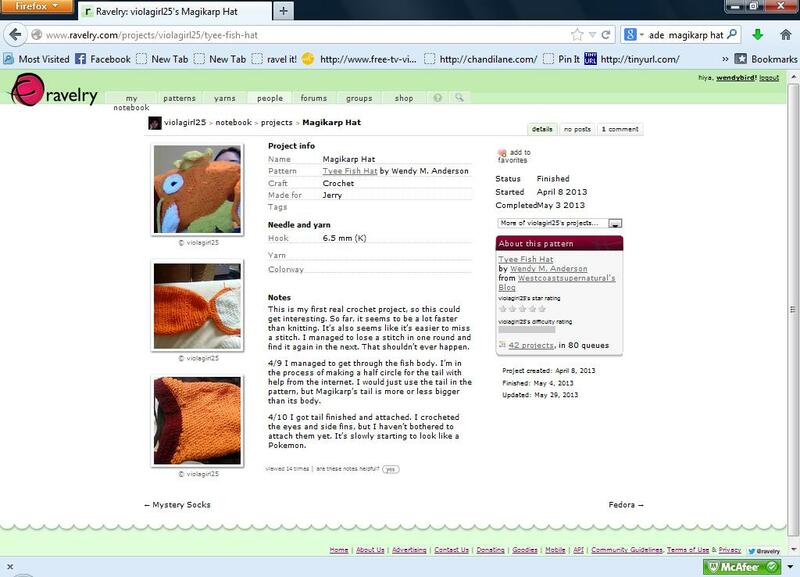 IF YOU WISH TO SELL ITEMS YOU MAKE PLEASE WRITE TO ME FIRST FOR MY WRITTEN PERMISSION. PLEASE RESPECT MY COPYRIGHT. IF YOU JUST CHANGE A COUPLE OF THINGS (FINS, TAIL, ETC) THAT DOES NOT MAKE IT YOUR PATTERN: IT IS STILL MY DESIGN!! 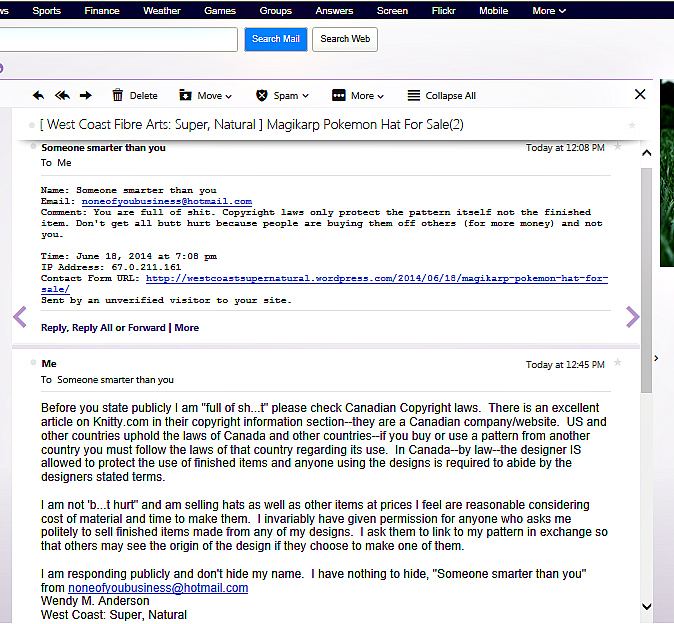 DO NOT POST VARIATIONS TO MY DESIGN ONLINE–ON FORUMS,BLOGS, RAVELRY, ETC. PLEASE READ MY COPYRIGHT PAGE BEFORE PURCHASING OR USING MY PATTERNS. COPYRIGHT IS A COMPLICATED ISSUE WHICH IS UNDERSTOOD AND INTERPRETED BY INDIVIDUALS DIFFERENTLY, AND VARIES FROM COUNTRY TO COUNTRY. THERE ARE, HOWEVER, INTERNATIONALLY RECOGNIZED COPYRIGHT LAWS. I ADVISE PEOPLE TO INVESTIGATE THESE; AND IF YOU ARE IN DOUBT ABOUT THE USE OF YOUR PATTERNS, PHOTOS, BLOG POSTS,ETC.,TAKE “SCREENCAPTURE” IMAGES AND SAVE THEM TO YOUR COMPUTER, AS I DID, AS PROOF OF USE BY OTHERS: IF THEY ALTER OR REMOVE THEIR POSTS/LINKS ETC. YOU THEN HAVE EVIDENCE OF THE ORIGINAL. 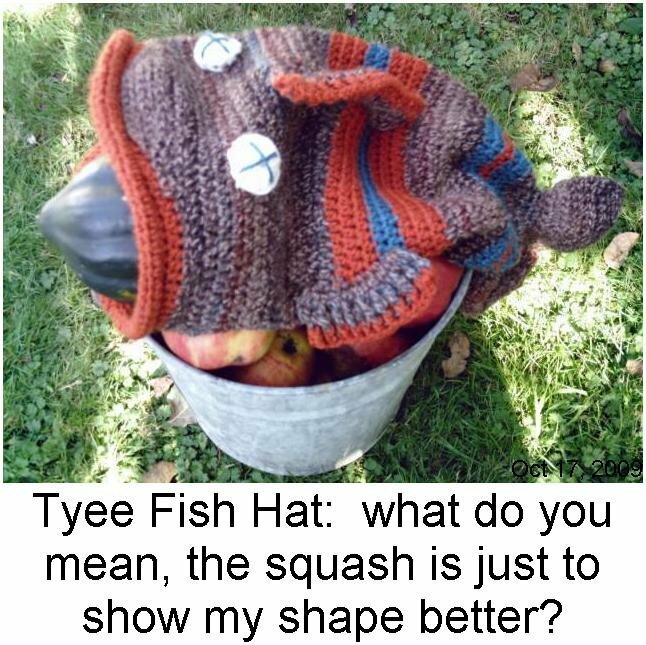 At long last: Tyee Fish Hat! This is a crocheted version of a very well-known knitted hat pattern, posted with the knowledge and permission of the knit-hat designer.